Let us pray with the Church. 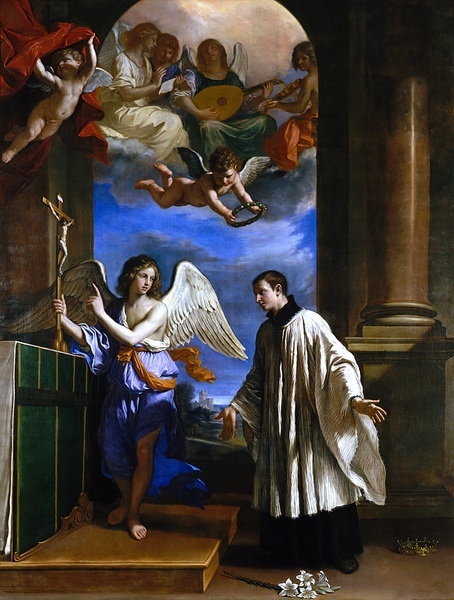 O God, giver of heavenly gifts, who in Saint Aloysius Gonzaga joined penitence to a wonderful innocence of life, grant through his merits and intercession, that, though we have failed to follow him in innocence, we may imitate him in penitence. The divine goodness, most honored lady [Gonzaga’s Mother], is a fathomless and shoreless ocean, and I confess that when I plunge my mind into thought of this it is carried away by the immensity and feels quite lost and bewildered there. In return for my short and feeble labors, God is calling me to eternal rest; his voice from heaven invites me to the infinite bliss I have sought so languidly, and promises me this reward for the tears I have so seldom shed. His biographers note: Saint Aloysius Gonzaga (March 9, 1568 – June 21, 1591) an Italian aristocrat, who entered the Society of Jesus. As a student at the Roman College, Gonzaga died as a result of caring for the victims of an epidemic. He was beatified in 1605, and canonized in 1726. Gonzaga is the patron saint for those living with chronic illnesses, particularly those living with HIV-AIDS.